Spermatophores of the Spotted Salamander (Ambystoma maculatum) are shown in the image above. During the breeding season, male spotted salamanders do a courtship dance to attract females, and then deposit the spermatophores for the females to pick up. The female salamander uses the sperm to fertilize her eggs. She will then lay eggs on twigs, leaves, and other underwater objects. Although other amphibians, such as blue-spotted salamanders and wood frogs breed at the same time as spotted salamanders, the eggs of these different amphibians are distinctive and easy to tell apart from one another. In fact, biologists can count egg masses to estimate the abundance of different amphibian species. 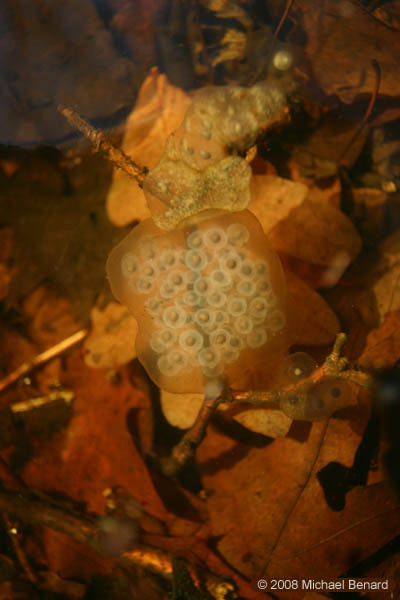 The photo below shows a spotted salamander egg mass near the bottom of the stick. 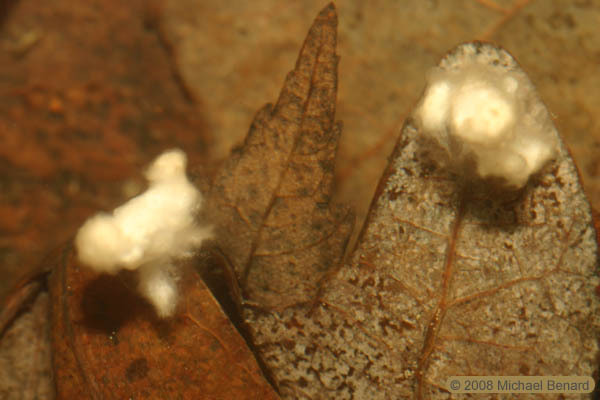 It can be recognized by the discrete opaque envelopes encircling each of the eggs. On the top of the stick, and to the lower right of the stick, are blue-spotted salamander eggs. These eggs lack the distinct envelope of the spotted salamander.